The shift from open to minimally invasive surgery has represented a key macro trend in the U.S. since the beginning of the 1990s. Robotic-assisted laparoscopic surgery, also known as robotic surgery, is the latest advancement in minimally invasive surgery. However, as a capital-intensive innovation, robotic surgery has often found itself on the opposing side of value-based health care and the associated emphasis on cost effectiveness. Without sufficient long-term evidence for superiority over less-expensive alternatives, the clinical and economic value of robotic surgery has remained questionable in the eyes of many skeptics. Nevertheless, the uptake of robotic surgery in the U.S. has been significant, with annual procedure volume exceeding 500,000 since 2015. Many hospital stakeholders embraced robotic surgery with aims to build brand image and competitive advantages. This has enabled robotic surgery to become one of the most rapidly adopted medical device innovations over the last two decades. It is clear that robotic surgery is here to stay, grow, and evolve. The medical device industry can ill afford to pass up on this trend. Device companies must get off the sidelines and engage more actively and positively with robotic surgery. However, there remain hurdles to be surmounted if robotic surgery is to live up to its fullest potential. Challenges such as technological drawbacks, training inadequacies, lack of cost effectiveness, and shortage of outcomes data will continue to hamper the progress of robotic surgery. That said, these challenges will present opportunities for medical device companies that can come up with unique solutions. This article details six considerations that companies should take into account in order to seize these opportunities. In the U.S., procedure volume growth of mainstay robotic procedures — such as prostatectomies and hysterectomies — has softened to low single digits over the last few years. 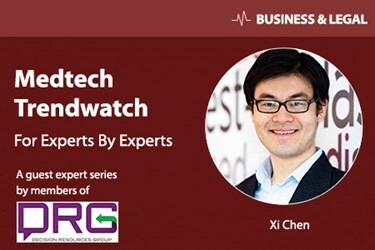 To identify new avenues of growth in the robotic surgery market, it is imperative to understand the addressable volume of other procedures, as well as the competition from alternative surgical approaches and treatments. Although robotic surgery has demonstrated clinical superiority over open surgery in many procedures, it will continue to face strong competition from other minimally invasive approaches, such as laparoscopy, that usually are more cost effective while delivering similar clinical outcomes. Nevertheless, there remain opportunities for robotic surgery to be established as the standard of care in procedures such as hernia repairs and colorectal resections, for which the patient populations are high and the penetration of other minimally invasive approaches remains low. Going forward, companies manufacturing robotic systems and instruments need to continue to assess the various procedural growth drivers in this market, and direct accordingly their R&D efforts toward procedures that present strong opportunities for penetration. Advancements in minimally invasive surgery and payer pressures to minimize the need for a hospital stay have made outpatient visits a natural outcome for healthcare delivery. Consequently, there has been a rapid rise in the number of surgical procedures performed in ambulatory surgical centers (ASCs) and outpatient settings, while hospital inpatient visits have fallen. However, most ASCs do not yet have access to a surgical robot. In order to penetrate this large and growing segment, manufacturers need to explore alternative system designs and sales models that are tailored for smaller facilities. A system with a smaller footprint, one that is mobile and adaptable to operating rooms for different purposes, will be attractive to facilities that have limited space. More importantly, the outright purchase of a robotic system is often prohibitively expensive for facilities that do not have a sufficient caseload to see a viable return on investment. Developing payment models that suit low-volume usage, such as free system installations with a pay-per-use plan, could be a way to penetrate these smaller facilities. Robotic companies should collaborate with hospitals and credentialing authorities to invest in more rigorous training and proctoring programs for their robotic systems, as well as establish centers of excellence where a high number of robotic surgeries, across multiple specialties, can be performed. By concentrating the procedures among well-trained surgical teams, the clinical value of robotic surgery can be more effectively demonstrated. In addition, the overall economic value of robotic surgery is further dependent on the quantity of trained surgical teams. A higher availability of trained personnel will allow maximal utilization of installed robotic systems, thereby generating a greater return on investment. Therefore, training needs to be more accessible to a broader base of surgeons and staff. Over the long term, robotic companies should push for greater integration of robotic surgery training into residency programs in order to inculcate familiarity and preference for their robotic systems among younger physicians. Demonstrating better outcomes, both clinical and economic, compared to other surgical approaches will be key drivers to the adoption of robotic surgery, especially in procedures where other minimally invasive approaches already have been established as the standard of care. These studies also need to choose clinical measures beyond those that are typically investigated. Typical perioperative and short-term postoperative measures, such as blood loss, operation time, length of hospital stay, and surgical complications have been widely tested in the past, but have yet to convince hospitals about the benefits of robotic surgery. Looking at long-term and non-typical outcome measures may provide the evidence needed to demonstrate the benefits of robotic surgery. Potential areas of investigation include patients’ long-term quality of life, anatomic pathology-based endpoints, rate of cancer remission, ergonomics, and physician fatigue. Robotic companies also should partner with other stakeholders, such as hospitals and medical organizations, to develop and maintain ongoing and comprehensive registries for all robotic procedures. Such registries can play an important role in the design of high-quality randomized controlled trials and provide up-to-date evaluation of the latest advances in robotic surgery. Finally, the unique ability of robotic systems to precisely record various operative data in real time (i.e., real-world evidence) should be exploited. Real-world evidence will allow an unbiased and multidimensional view of robotic surgery, which may reveal outcomes that would be difficult to assess with randomized controlled trials. The current robotic surgery market is primarily driven by converting open procedures into surgeries that can be performed robotically. 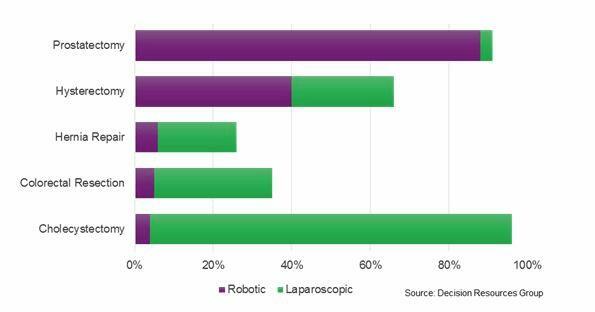 As robotic systems increasingly enter the general surgery market, where laparoscopy plays a bigger role, penetration will be challenging. Expansion into areas where laparoscopy is the standard of care will depend on further advances in technology and instrumentation designed specifically for robotic surgery. First, developing the full array of instruments currently used in and available to traditional laparoscopy — such as different sizes of staplers, articulating energy devices, and suction/irrigation devices — will allow robotic surgery to compete on a more level playing field with laparoscopy. Future instruments should leverage the computational power and precision inherent in robotic systems to drive superiority over laparoscopy. This could include traditional tools with smart-sensing capabilities, or nontraditional tools designed specifically for the robot to perform tasks that traditional tools cannot accomplish. The drive for innovation and superior outcomes will challenge R&D teams, both technically and financially. Robotic companies need to be open to partnerships with other companies, integrating novel technologies applicable to robotic surgery, with the aim of expanding the total addressable market or gaining competitive differentiation from other companies. Going forward, robotic companies need to stay vigilant and identify potential targets for partnerships, be it a small start-up developing innovative instruments or a technology giant with capabilities in data science and software development. Robotic surgery has established a significant presence in today’s operating rooms, and it can become integral to the operating rooms of tomorrow if current barriers — such as technical limitations, training inadequacies, lack of cost effectiveness, and shortage of outcomes data — can be eliminated. The responsibility to eliminate these barriers and push robotic surgery toward greater adoption falls on the shoulders of the medical device industry, presenting opportunities for both current and prospective robotic device manufacturers to demonstrate unique value. However, new challenges still can/will emerge. Regulatory changes, healthcare reforms, and the emergence of new therapies may yet hinder the robotic surgery market before it reaches its full potential. Competitors need to remain vigilant and proactive toward new challenges, and innovate in line with stakeholders’ needs. Xi Chen is an analyst on the Medical Device Insights team at Decision Resources Group, where he authors Medtech 360 products for global medical device markets. Xi specializes in a number markets related to endoscopy and surgical technologies, including laparoscopy and ENT. Xi graduated from the University of Toronto with a PhD in biomedical engineering. Information for this article was provided by DRG’s U.S. Market for Laparoscopic Devices and Carving Out a Share of the Robotic Surgery Market: The US Perspective reports.